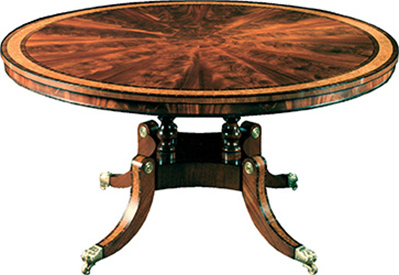 Classic circular dining table in the Regency style. The beautifully crafted top is laid with figured and matched radial mahogany veneers surrounded by a banding of burr elm, bordered with coromandel and ebony stringing. The mahogany faced apron also features a decorative moulding of coromandel to the lower edge. The turned column and platform base is supported by sabre legs with coromandel and burr elm decoration. Brass rosettes surmount the side faces of the legs.